Bowfishing combines the skill of archery, hunting and fishing together into one sport. Gearing up with the right equipment will help you ensure you have an enjoyable outing on the water. The first bowfishing consideration is in the bow you use. You can use a new or used bow and you don’t have to spend a ton of money or have a high draw weight for this sport. You can most likely press an older hunting bow into bowfishing service or buy one especially designed for this pursuit. I own a Diamond Edge Sonar bow which is designed especially for bowfishing and comes at a great price for a new bow completely set up for the sport. With a draw weight from 5 to 55 pounds and a draw length of 18”-30”, this compound bow is sure be an easy bow for young and old alike to shoot all day or night. What’s more is that this bow comes ready to fish equipped with a reel, bowfishing line and arrow. 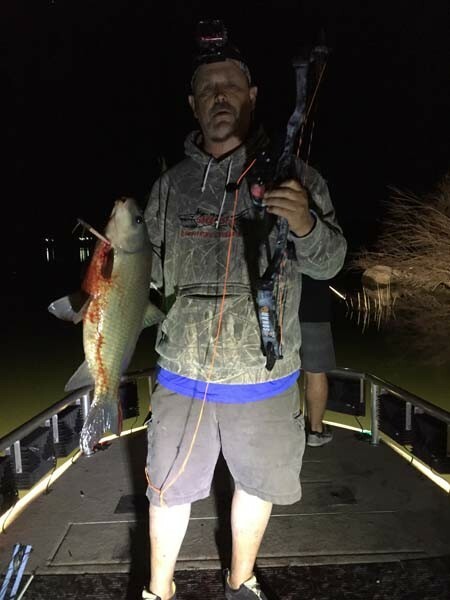 Professional bowfishing guide Marty McIntyre with a Diamond Sonar bowfishing bow, featuring an AMS reel, and a buffalo shot on Lake Belton. The next consideration is the arrow and point. The arrow, along with your bowfishing line connected to it, are your main connections to the fish so quality is of paramount importance. I am a fan of the AMS Choas line of points and arrows as well as the Muzzy Fish Arrow and Carp Point. Both of these are great combinations for general every day bowfishing action. It is important to be sure you have a sharp straight point as this is your main “point” of penetration on the fish. If the point ever goes dull, be sure to have some replacement tips on hand. The barbs on the points mentioned above keep the fish on the arrow so you can retrieve and land the fish in the boat or on land. On these styles of points, the tip of the point partially unscrews so you can remove the fish by reversing the twin barbs. You can get back to the action by moving the barbs back in place and tightening up the tip against the barbs again. There are two main reels on the market built with modern technology and innovations around bowfishing are the AMS Retriever and the Muzzy XD Spincast bowfishing reel. Both of these reels have their pros and cons you will want to find what works best for your style of bowfishing. For bowfishing line, I recommend 150-200 pound test at a minimum. Many reel kits you purchase will already have string pre-loaded so you are ready to fish. In whatever gear you choose, be sure it is high quality and can stand a beating. After all, bowfishing is a sport for the wild at heart!